The settings page allows you to do several tweaks to Go Fetch Jobs behavior. 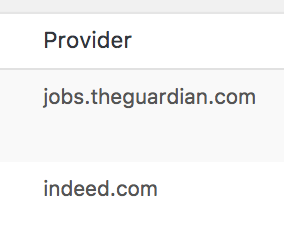 (*) GOFJ uses each job title and external URL as the unique key. Since some RSS feeds that use https:// might be considered invalid if your site does not use https:// this option tries to load these feeds through a CORS proxy. To enable geolocation for imported jobs (not available on all feeds) you need a Google API key. Visit How to Generate a Google Maps API Key for more info. This field allows you to set the rate at which the importer will geocode any RSS feeds containing geo locations (latitude/longitude). The rate limit is based on your Google maps geocoding plan (Standard by default). The default value is 50 locations per second. The default status for all imported jobs. The job duration for all imported jobs. If checked, this option will make the imported jobs external apply link visible to site visitors. By default, only registered users can see the application link. This option allows you to set the text that is appended to job description excerpts. Canonical links allow you to notify search engines about the original source of the jobs imported. Since duplicate content is a big no-no to search engines, having jobs with the same content as the original source or with similar content on your website is seen as a negative. Checking this option could help your SEO.